John Moore and I get together occasionally to enjoy the beauty that Arkansas has to offer. He and I share similar views on a lot of things so it’s easy for us to keep a conversation going while hiking to some of the most remote places in the Natural State. This particular trip we were meeting up to explore the area around a recently closed campground, Albert Pike. In 2010 a huge rain storm came through and completely obliterated the campground and it’s current inhabitants, it was quite the news across the nation. The cause? 10″ of rain overnight, within a span of 6 hours. It was one of the worst storms that part of the state has ever seen. It was such a tragedy, the floods from the storm ended up claiming 20 lives; may they rest in peace. 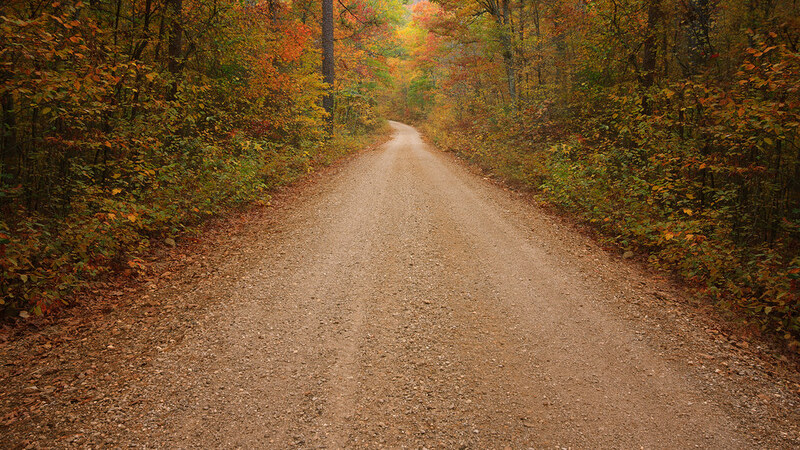 This particular road is one of the roads which leads to the campground itself. We were there in autumn during perfect colors and I ended up with quite a few good shots from that trip; this being my favorite.